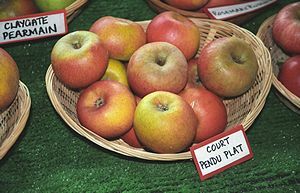 Court Pendu Plat - Dessert Apple Tree £12.75 - Dessert Apples - Late Season Apple Trees and Fruit Trees For Sale. Buy at competitive prices with wholesale discounts. This very old dessert apple has a rich aromatic flavour with a pineapple-like sweetness and acidity. The texture is firm and the fruit is at its best if picked in October and stored for a month. It is a good choice if you are short of growing space as the tree will remain fairly moderate in size even when fully mature. It is also a very attractive tree, with pretty white blossom in the spring and tempting green flushed red apples hanging from the branches in the autumn. 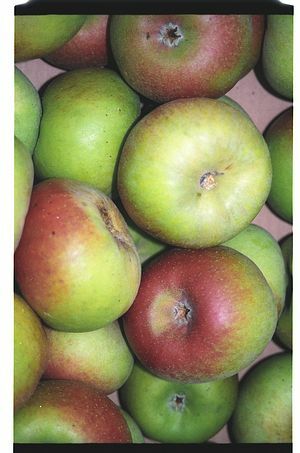 As a late flowering variety it remains fairly hardy and so good for areas prone to late spring frosts.<br> The origins of this apple variety are not certain, but it was very popular in France during the 17th Century and was possibly first introduced by the Romans. This very old dessert apple has a rich aromatic flavour with a pineapple-like sweetness and acidity. The texture is firm and the fruit is at its best if picked in October and stored for a month. It is a good choice if you are short of growing space as the tree will remain fairly moderate in size even when fully mature. It is also a very attractive tree, with pretty white blossom in the spring and tempting green flushed red apples hanging from the branches in the autumn. As a late flowering variety it remains fairly hardy and so good for areas prone to late spring frosts. 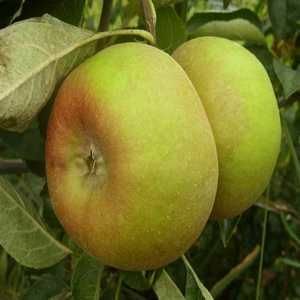 The origins of this apple variety are not certain, but it was very popular in France during the 17th Century and was possibly first introduced by the Romans.